Projects: The Enemy of Change? To adapt our organisations to thrive in the Social Age will require a holistic pattern of adaptation: you cannot fix an ecosystem challenge with a single touch point. Reflecting on this got me thinking about projects, and more specifically whether projects are the enemy of change. Many aspects of organisational life are geared up around the definition of, procurement of, delivery of, and endpoint, of projects. And yet the real world, and the social systems that exist within it, have no start and end point. It’s possible that the unit of organisation we use most widely, the project, is itself both part of the resistance to change and part of the system we are trying to change. I don’t wish to over dramatise, but there’s certainly something about the way that projects are delivered in isolation, whilst change requires an alignment of energy and holistic pattern of adaptation, or at least it does if you want it to bite. I’ve been sharing the change work widely this week, really stressing that it is not about a new change process: building a Socially Dynamic organisation is a new model of business design, it’s a new type of entity in a new type of world, agile not through great effort, not through system or process, but rather through its deep social connection, fairness, and ability to act at speed without becoming breathless. 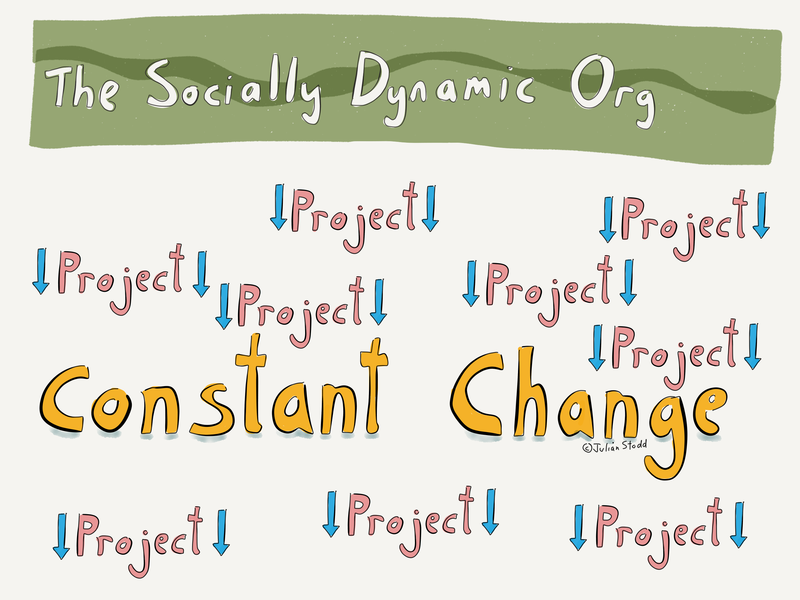 The Socially Dynamic Organisation is able to change because it is itself adapted to change: instead of creating a new process, we have created a new space. If we get it right, we create the fertile ground. But as we do so, it’s right to consider some of the unifying principles that have gone before. Do we still need teams that work like this? Projects that work like this? Even budgets that work like this? Do we still need old models of power and control? Old models of learning? Sometimes change is less about what you do that’s new, so much as what you stop doing that is old and redundant. This entry was posted in Change and tagged Change, Change Curve, Control, Learning, Organisational Change, Power, Projects, Reflection, Socially Dynamic Organisation. Bookmark the permalink. 3 Responses to Projects: The Enemy of Change? On day two of unpremeditated reblogging, this post came across my feed. As an unashamed project doer, I can’t help but respond! I don’t think projects are the problem, in an of themselves. My best work is done when I’m up against a deadline, when I know there is a finish line and must pull out all the stops to get there. There’s certainly an ideal timeline, too tight and there isn’t room for creativity or, as importantly, collaboration and co-creation. As a project doer, whether my own or for a client, the quality of what we are able to achieve is a direct result of the quality of person we are able to convince to collaborate with us. Yes, convince, not compel. The first litmus test of any project is engagement. It sometimes takes perseverance, a small group of die hard ‘believers’ to jump the first few hurdles. But when I feel overrun with interest and enthusiasm, I know that what I am doing is a success. Not all projects end up the same way, but with each, I am able to expand my network, both inside and outside the organization I am with, learning as I go who can contribute what, and who I like to work with. The organization that is able to attract people who are enthusiastically interested in working together because of shared values and passions is the one who will be able to withstand and thrive in our changing environment because of the connections that we create between us. And my way of doing this is through projects. I need that light at the end of the tunnel, that goal I achieve, review and iterate, learning with each pass and project. Thanks for inspiring this 5am rant Julian!